Where does my target audience go to find information on products and services? Has it changed? Am I visible and relevant on that media type? What does my company look like across the internet, including social media and on mobile devices? Do I have a strong enough presence to be competitive? Am I driving clients/consumers to my business? How do I know? Do I initiate an ongoing dialogue with my clients/consumers to drive referrals and repeat business? Is the amount I reinvest in marketing sufficient to meet my revenue goals? These questions are hardly new to seasoned business owners, yet relevant enough to revisit each year. New mediums pop up and can quickly become popularized. Who heard of Instagram just a few years ago? It is important to know the options and to take the time to evaluate the merits and relevance of each. Communication mediums should be well matched to each business based on an evaluation of the customer/clients before investing the time necessary to create or properly maintain each one. 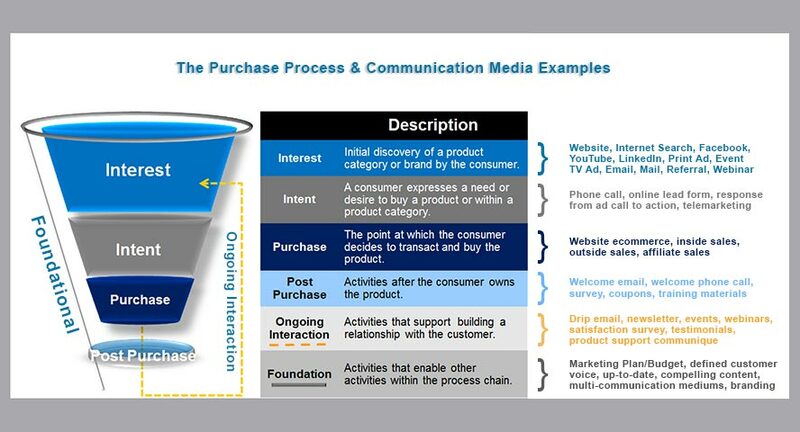 Strategies to reach out to targeted consumers/clients should be applied to each step in the purchase process. A complimentary communication plan can then be applied to each step to aid in moving the targets to the next step in the purchase process. The tremendous growth of social media has made it a valuable marketing tool for businesses of all sizes. Social media networks have become mandatory places for online advertising strategy. During the past few years, the explosive growth of online social media sites like Facebook, Google+, YouTube, Twitter and Pinterest has resulted in billions of people becoming registered users. There will be mandatory tools and chances are that most companies will have exclusive departments handled by expert writers who will independently handle the firm’s social media strategy. In a sphere that’s changing continuously due to expanding technologies and innovative thinking, some social marketing trends will also change, while others may remain the same or change their policies to stay in the running in this highly competitive field. It is predicted that social media marketers will have to watch out for Google+ despite the fact that Twitter and Facebook hardly look that they are declining in any way. But the fact is that Google+ is growing and growing fast. Other social media networking sites are also innovating, particularly those which are video/image based. Facebook will complete a decade of its existence next year. It is expected that the world’s number one social media site will keep on targeting mobile devices and giving advertisers chances to target their advertisements in a better way. Whichever way the other social media networks go almost all marketers will realize that it’s absolutely essential to spend money and time on social media endeavors.